Pallet boxes and large containers made of plastic. 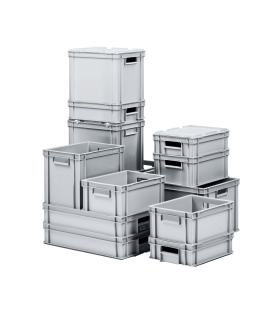 KIGA boxes and containers and pallet boxes for products, workpieces, packing goods etc. which have to be stored or transported dust protected. Almost every company uses Euro boxes. 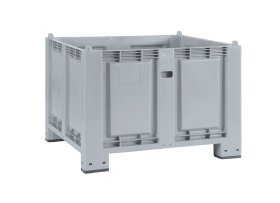 Either for storing of small parts of for dispatch commissioning. Using new plastics even allows an application in the food industry or the pharmaceutical industry. 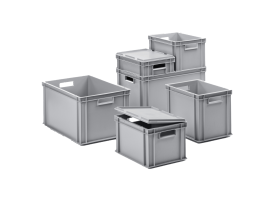 All Euro boxes of our series can be combined with each other and are available with a standard lid or a hinged lid (suitcase box). 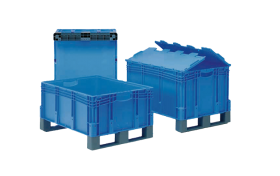 Large plastic containers are available in different designs: Either with feet or skids, with closed walls for easy cleaning or perforated sides for airing of your products - we as a producer of pallets certainly have the right container in our product range. Matching lids and outlet valves for our large plastic containers round off the product range.